Poet Phil Hall launched his latest collection, Conjugation, in Regina in early May. 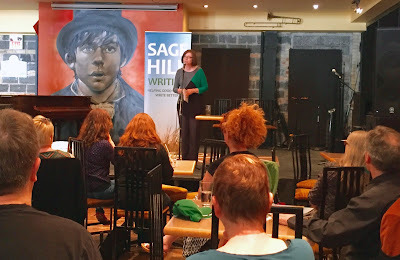 The reading was hosted by the Sage Hill Writing Experience, and Hall was in Saskatchewan to lead its Spring Poetry Colloquium, which I hear was amazing. 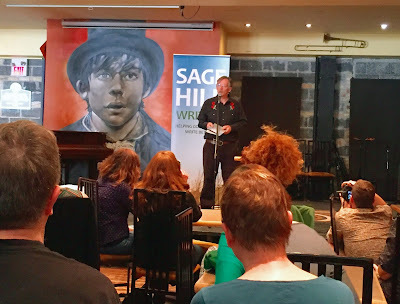 And for some reason, these cell phone pix appear far over on the warm spectrum, a happenstance that might perhaps be attributed to the confusing profusion of redheads in the room... Or the red sign of the Artful Dodger.